Unless you have great genes (biologically thicker and fuller hair), gradual thinning hair is something that most men and women experience, even starting in early 20s. In this ultimate guide of the best hair loss shampoo reviews, we analyzed a handful of both popular and upcoming products formulated for thinning hair. We also went over research studies on hair regrowth in order to verify the effectiveness of the ingredients contained in these best hair growth products to find out what works and what doesn’t. 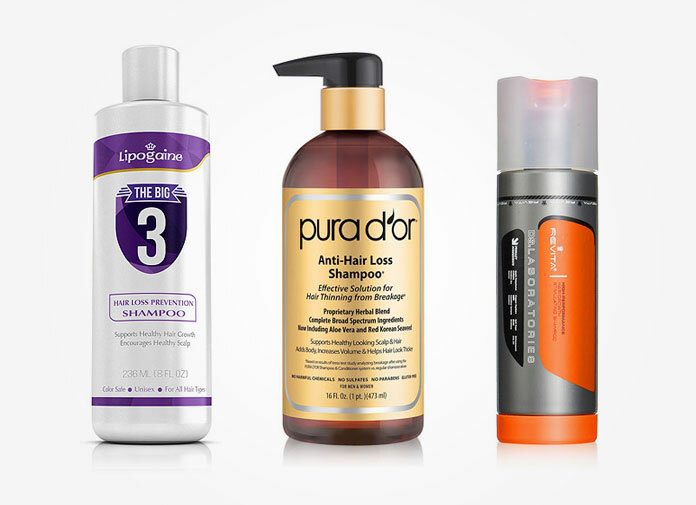 Here is our top 10 chart covering the best shampoos for hair loss. Click here to go straight to the 10 best hair loss shampoo reviews. UPDATED: First, let’s talk about the most popular trends in 2018 (as well as the last couple of years including 2017 and 2016) for formulating best hair growth products. We noticed both new and existing brands are coming up with shampoos that target multiple causes of hair loss simultaneously: decreasing hair shedding, preventing further hair loss, promoting hair thickness, and stimulating hair growth. They do this by adding multiple ingredients that are often backed by hair loss research studies. Some of these ingredients include saw palmetto, rosemary, peppermint, and caffeine just to name a few (there is a whole lot more!). What’s the trend for formulating the best hair loss shampoo in 2018? More and more brands are adding multiple natural DHT-blocking ingredients to stop hair loss and stimulate new hair growth at the same time. This is great news for men and women looking for the best hair loss shampoos to take care of multiple alopecia symptoms. If you think about it, it is practically impossible to include every researched ingredient (both organic herb plants and scientific molecules) into your daily hair regrowth solution, but that shouldn’t mean settling for only one type of result. Also known as Sodium Lauryl Sulfate or just simply SLS, this chemical compound is often used in cheap drug store shampoos. While Sulfate does a great job cleansing your hair thoroughly, this harsh chemical also damages your scalp and hair. Since this was the first thing on our checklist, ALL of the best hair loss shampoos we listed here are sulfate-free (except for Nizoral shampoo, which we decided to include in the best shampoo for hair loss list this year, because of its specific and effective formula for getting rid of dandruff and itchy scalp). As we mentioned earlier, adding multiple botanical herbs and plants are trending practices right now! This is highly beneficial for users. Can you imagine taking multiple herb supplements or topical applications to grow your hair everyday? Some of these hair growth promoting and nourishing ingredients include: rosemary oil, peppermint oil, tea tree oil, cedarwood oil, nettle extract, pumpkin seed oil, seaweed extract, saw palmetto, He Shou Wu extract, alma oil, emu oil, black cumin seed oil, aloe vera, copper peptides, caffeine, and of course biotin (See top 5 biotin supplements for hair growth). Also note that almost all of the best hair loss shampoos you will see in this review contain at least a two ingredients for preventing hair loss and reducing the levels of DHT hormones, which is known to be the main cause of male and female hair loss. Pura dor shampoo has been the number 1 Amazon best seller in the best hair regrowth shampoo category for years and can be found at most major pharmacies and drugstores such as Target, Rite Aid and CVS. “What’s so special about the pura d’or hair loss shampoo”, you ask? To answer that, we need to talk about the HUGE list of ingredients contained in the shampoo. 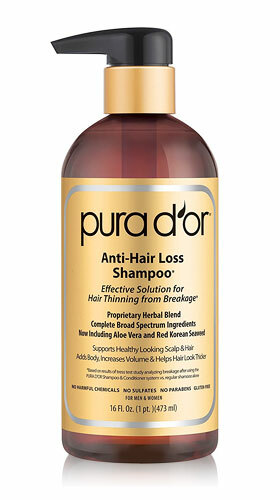 Pura d’or anti-Hair Loss shampoo (as the name indicates) is specifically designed for one purpose – Preventing hair loss. There are 17 botanical herbs included in the shampoo that act as natural DHT blockers for both men and women. This includes rosemary oil, tea tree oil, saw palmetto extract, red Korean seaweed, pumpkin seed oil, nettle root extract, niacin, lemongrass oil, green tea extract, He Shou Wu extract, cedarwood oil, sage oil, amla oil, argan oil, black cumin seed oil, and biotin. Basically, it’s PACKED with powerful hair growth ingredients! Rosemary oil: There was a study testing the effectiveness of using rosemary oil for hair loss solution, compared to Minoxidil 2% – the only FDA-approved topical hair regrowth treatment. When the researchers measured the results in 6 months, they noticed a significant increase in hair count (= new hair growth). Saw Palmetto: Using saw palmetto for hair loss is one of the most popular alternative remedies. Saw palmetto is believed to effectively block 5-alpha-reductase activities, which means it prevents the main cause of hair loss – androgenetic alopecia in men and women. Rosemary oil and cedarwood oil together: another research study tested the effectiveness of using a mixture of multiple essential oils (rosemary, lavender, thyme and cedarwood to be exact – 2 out of 4 oils are included in this shampoo). The results proved that participants who applied this topical oil treatment showed big improvement, compared to the placebo group (44% vs 15%). Green tea extract: There is another research we would like to share here – green tea extract. Green tea is rich in Polyphenols. Polyphenols are compounds often found in nature such as plants, vegetables, and fruits. A study published in 2015 shows how Polyphenols play an active role promoting new hair growth (Read about Black currant seed oil – another natural rich source of Polyphenols and Dr Oz recommendation for thinning hair). We can go on and on about all these different scientific studies and benefits for each ingredient. The point we would like to make is that Pura d’or has done its homework. All of these bio-active ingredients are designed for 1) Preventing hair loss by blocking DHT activities, 2) Nourishing hair follicles, and 3) Promoting healthy hair growth. Ultra Labs’ Hair Surge caffeine hair growth stimulating shampoo is another popular option for hair loss treatment at home. Ultra Labs approaches the formula differently from the Pura Dor hair loss shampoo, but in a good way. 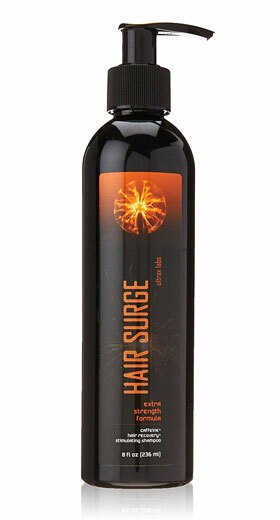 The main active ingredient of Hair Surge shampoo is caffeine. Research published in the International Journal of Dermatology shows that when hair follicles that are exposed to caffeine, testosterone levels are greatly reduced. In addition, the researchers also observed hair growth stimulating effects of caffeine in their test results. This means that if you are looking for the best shampoo for hair growth, this shampoo formula is a great option. Ultra Labs Hair Surge shampoo also includes Ketoconazole, which has anti-inflammatory and anti-fungal properties to prevent dandruff hair loss issues. Lastly, it also includes saw palmetto, which is known as a natural DHT blocker. 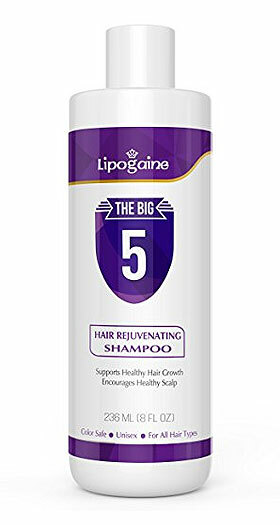 Lipogaine’s The Big 5 hair loss prevention shampoo contains powerful blends of active ingredients for preventing hair loss, reducing hair fall out, and increasing volume according to the official website. First, Big 5 shampoo contains Biotin as a starter, which is basically a hair loss 101 essential and is recommended by numerous doctors in the purpose of nourishing hair follicles and healthy hair growth. Lipogaine Big 5 shampoo also contains caffeine, which not only stimulates hair growth, but also inhibits the DHT activities inside the scalp. Another ingredient is black castor oil which people are RAVING about for its ability to generate hair regrowth in just 1 month. Other hair stimulating ingredients include Amla oil (an Ayuverdic hair growth herb), black seed oil, and nettle extract. The majority of reviews also give an indication that this is possibly the best shampoo for falling hair. Users actually saw a big difference in terms of decrease in hair fall, followed by new frontal hair growth on some people. 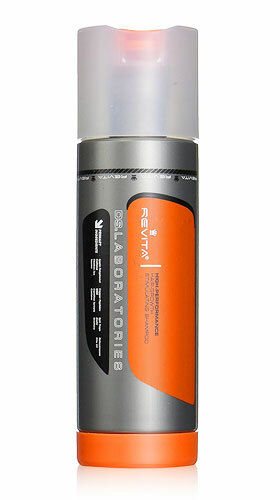 DS Laboratories focuses on providing cutting-edge research-backed products and the Revita shampoo represents the heart of the company’s scientific research efforts and the results. There are 12 technological ingredients for effective hair growth stimulation. Revita shampoo contains Apple polyphenol, which Japanese researchers found has hair growth promoting properties and extends the anagen phase (meaning encouraging longer hair growth). It also contains copper peptide, known to be just as effective as Minoxidil. Copper peptide molecule fights hair loss by inhibiting DHT hormone, strengthening follicles and stimulating hair growth, at least one study shows. Other hair healthy hair ingredients in the Revita formula include Taurine and Methylsulfonylmethane (MSM). In order to get the maximum hair growth benefit, the company has specific instructions: leave it on for 1-2 minutes before rinsing. Then, repeat the process again, but this time leave it on the scalp for 3-5 minutes. DS Labs also advises to use it at least 5 times a week for the best hair growth shampoo results. 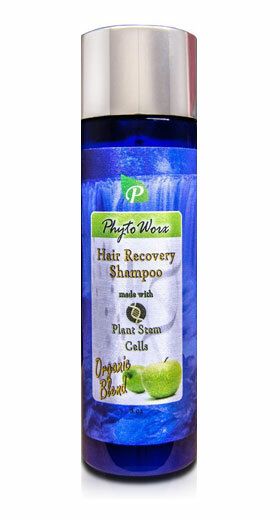 PhytoWorx shampoo takes an additional step for their shampoo formula: incorporating plant stem cells to stimulate hair growth. This unique formula contains organic plant-based stem cells (Malus Domestica) and several essential oils including rosemary, eucalyptus and peppermint oil. The latest article we published shows how powerful peppermint oil can be when it comes to promoting hair growth. The study shows that peppermint oil (which is included in the PhytoWorx hair loss shampoo) works even better than Minoxidil when the results were measured in just 1 month (click here to see before and after results of this study). 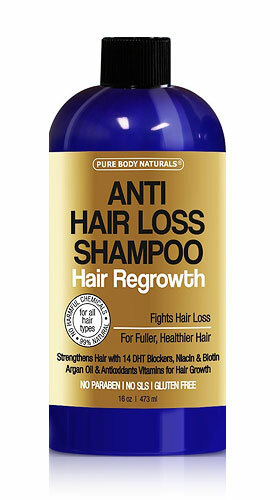 Pure Body Naturals anti-hair loss shampoo contains 14 DHT blocking natural ingredients. To start, it has biotin for healthy hair growth and saw palmetto for inhibiting DHT hormones to the roots of hair follicles. Nettle extract is another highlight of this hair loss prevention shampoo. Nettle extract is regarded as a natural blocking DHT agent and slows down the hair-aging process according to a study conducted with 620 participants suffering from hair loss. We also noted many reviewers reporting very positive results. For instance, one of the users uploaded her before and after photos of using this shampoo. She gave birth about half a year ago and has experienced extreme hair thinning since, especially on the front and sides of her head. Her before and after hair transformation is quite remarkable. To be specific, her scalp is very visible on the side and frontal line in the before photo, but the after picture shows the same thinning spots were COMPLETELY filled in. She also mentions that she only used it for two weeks so far. 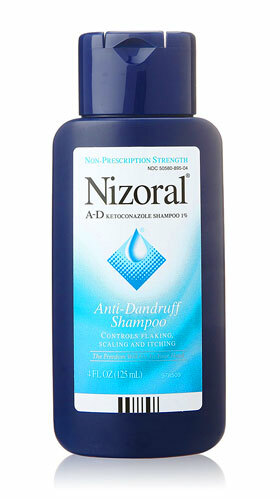 If you are experiencing hair loss due to itchy scalp or dandruff, Nizoral shampoo is THE best dandruff shampoo to use. Nizoral is a reputable brand and focuses on only 1 thing – getting rid of dandruff once and for all – and they do it extremely well. Dandruff is a form of fungus on the scalp which often creates flaking and constant itching. People suffering from dandruff also tend to experience minor to severe hair loss due to inflammatory scalp reactions. Nizoral shampoo contains Ketoconazole 1%, the highest strength you can get from any over-the-counter product. Another great thing about Nizoral shampoo is that the company recommends you to use it only twice a week. This means that you can try one of the other best hair loss shampoos packed with DHT blocking ingredients (such as Pura Dor and Lipogaine Big 3) for the rest of the week in order to get the maximum benefits of regrowing your hair. Pronexa shampoo is the ONLY shampoo we found with a USDA Bio-based certification. This means that this shampoo is certified by USDA to contain the exact percentage of bio-based content listed on the label. This is a clear indication that HairGenics takes the overall quality of hair stimulating ingredients included in the formula very seriously. 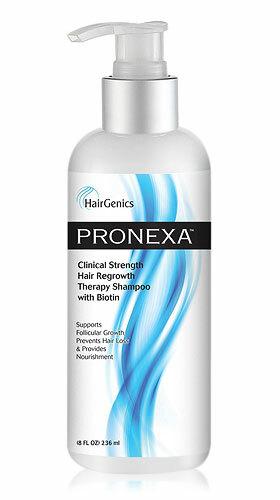 Ponexa shampoo contains the highest level of biotin, which clinical research suggests for maximum hair growth. Other anti-hair-loss ingredients include seaweed extracts to provide anti-inflammatory properties, aloe vera to unclog and clarify the pores on scalp, MSM to increase the number of hair growth, and finally saw palmetto extract to block DHT hormones. 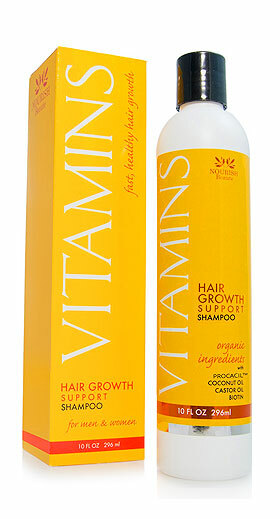 Vitamins hair loss shampoo is rather new in the hair growth shampoo category. What’s so appealing about this hair loss shampoo is its powerful ingredients to stimulate hair regrowth and stop hair thinning and falling hair. Nourish Beaute’s VITAMINS hair loss shampoo includes a molecule compound called Procapil. Procapil works by sending signals to hair follicles to prevent Dihydrotesterone (DHT) activities. This molecule also has the ability to increase the level of blood flow inside the scalp for full-on follicle nourishment, which results in healthier and thicker hair. The clinical studies show that Procapil shampoo enhances follicle cell activities just after 2 weeks, which makes it the best shampoo for thinning hair. They have many happy customers as well. In fact, some of the before and after photos posted by actual customers make it more clear how well this shampoo works for thinning hair. One woman even says that she only took about 1.5 months to see hair re-growth on the frontal area. This sulfate free shampoo has been around for many years. Specifically formulated to remove DHT build-up, Regenepure DR shampoo makes it to our best shampoo for hair loss list, which contains ingredients gentle for hair, but powerful for stimulating hair growth. Regenepure DR shampoo contains Ketoconazole which has an anti-inflammatory property to prevent fungal scalp infections or itchy scalp symptoms – a common cause of hair loss. Another ingredient is Aloe vera for providing a soothing effect to the scalp and the ideal environment for healthy hair growth. The formula also contains B vitamins, castor oil, zinc, and saw palmetto extract, and menthol, which is found in peppermint oil. When it comes to the effectiveness of hair loss prevention, there are quite a number of reviewers with great improvement from using the shampoo on a daily basis. Another reviewer also shares his honest opinion ( with photos). As you can see in the first photo, the scalp on the crown area is plainly visible. In the after picture (1 month later), those hair thinning spots are filled in (even though the lighting makes it somewhat difficult to look closer, you can still tell that there is definite new hair growth on those thinning spots). One common complaint we came across is that DR shampoo tends to make hair dry. The simple solution for this is to use a hair conditioner right after shampooing your hair, so both your scalp and hair are fully moisturized. Or you can use several drops of oil such as jojoba oil or castor oil for both moisturizing and nourishing benefits. The trend we saw for Hair loss shampoos in 2018 as well as the last couple of years is really about providing multiple benefits that doesn’t just stop at hair loss prevention. 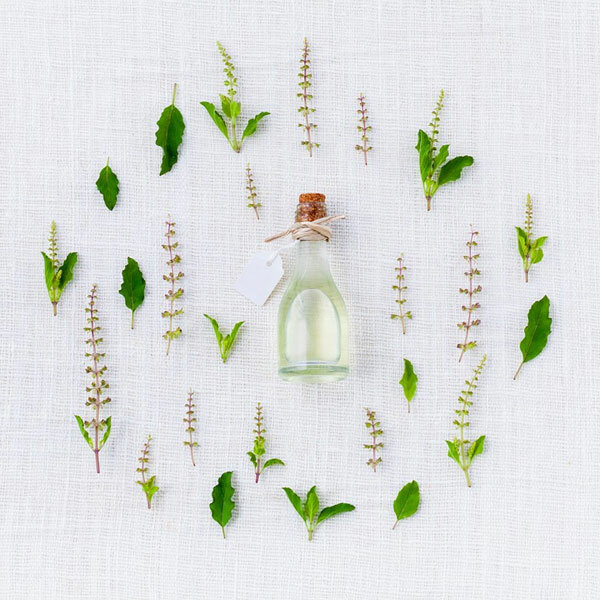 More and more brands are incorporating various natural (and organic) herbs in their shampoo formulas that are known to block DHT activities on the scalp, nourish follicles, and stimulate hair regrowth. We predict this beneficial trend will become the mainstream and will only get better each year. It’s also important to note that the top 10 best hair loss shampoos we listed above are ALL sulfate-free (except for Nizoral – dandruff removal shampoo) and no harsh chemicals are added in them. So if you are also looking for the best organic hair loss shampoo, you can go with any of the items listed here. Each of these hair loss prevention shampoos is truly unique and definitely worth trying. If you are still having a difficult time deciding the best hair loss treatment for you, a good starting point is to try VITAMINS hair loss shampoo which includes Procapil, the new molecule, designed to send signals to hair follicles to prevent DHT hormone contact and increase blood flow in the scalp. Lipogaine’s Big 5 shampoo is another solid option for both men and women because the formula contains TOTAL 17 organic DHT blocking herbs and plants (rosemary oil, alma oil, nettle extract, and saw palmetto just to name a few) as well as caffeine compounds, which the research shows has a powerful ability on reducing DHT hormones and lengthening the hair growth phase for your hair follicles. What’s your go-to hair loss shampoo? If you have severe dandruff, try Nizoral. It’s the only shampoo that actually worked for me to get rid of dandruff! I’ve only used Pura dor shampoo for just under several weeks and I’ve already seen a difference reducing my excessive hair fall. I also love the pleasant smell. I don’t know much about Pura dor (even though I know it’s really popuplar), but Lipogaine’s the big 3 shampoo really works for reducing hair loss. I had some pretty bad hair thinning on the crown area and ended up finding this shampoo. My hair already feels a lot thicker after using it for a couple of month. But you have to be consistent to see the result – I shampoo my hair daily and leave it for 5 minutes before rinsing it out. If you wanna try a pura dor shampoo, the gold label has 15 DHT blockers and the blue one (origina formula I think) has total 12.